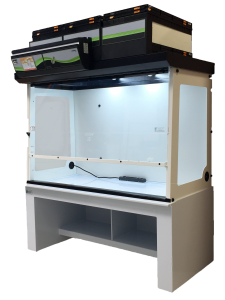 As you may know from our previous post, we fabricate custom polypropylene fumehoods fitted with Erlab’s top-of-the-line filtration technology. Our hoods are helping police chemists stay safe while testing the increased amount of drug investigations that come through their lab. You’ll see a brief mention of us in this news article. We’re happy to play a small part in the safety and well-being of the people who protect and serve. Ductless hoods can be a perfect addition to most labs, but sometimes get overlooked because of old EHS concerns over their effectiveness. Ductless fume hoods (also called filtered fume hoods) have had bad rap because historically some didn’t do what they were intended to do – which is keep the user safe. Poorly constructed filters. There wasn’t enough filler material which created peaks and valleys within the filter cartridge, therefore creating paths of least resistance which caused breakthrough of the noxious fumes. No discussion or validation between purchaser and vendor on what chemicals were acceptable for use with the filter(s) being purchased. The wrong filters were used for the particular chemicals in use. Many filters are made so that the filter material is specific to what is being used inside the hood. Poor design of airflow through the enclosure and filters. Not enough or too much air-flow inside the hood itself. 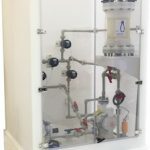 Opinions are shifting and these preconceptions are falling by the wayside thanks to Erlab, Inc. and the steadfast and diligent work they’ve done to create state-of-the-art filtration method using their proprietary filtration substance. They’ve also designed a user-interface that works together with the user and lab manager to keep hoods working at their optimum level at all times. The technology helps users know if a breakthrough is detected, if the airflow is insufficient and when it’s time to change the filter. Single Use Filtration. Only ONE filter is needed for all approved chemicals used in the hood as compared to stacks and stacks of different filters for various chemicals. Partnering with Fume Hood manufacturing experts to create hoods that are ANSI/ASHRAE tested – meaning airflow through the hood meets and often exceeds safety standards set by the AIHA. Processes are in place for chemical use validation and safety is guaranteed if the hood is used as described. If you have steered away from ductless hoods for any of the reasons above – it’s time to take another look. Recent developments have allowed for ductless hoods to be a viable option in many labs. Ducted vs. Ductless – what’s the best choice? 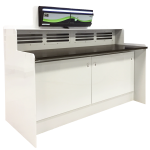 Plastic Concepts has recently partnered with Erlab, Inc. the leader and creator of ductless fume hood technology. 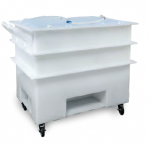 We make custom polypropylene hoods fitted with Erlab’s proprietary equipment -which is the best filtration technology available in the market. 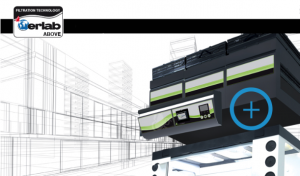 This is the fume hood of the future, and there’s a good reason why! They are economical, convenient, environmentally friendly and are safe for use with approved process applications validated by Erlab’s own chemists. If you are unfamiliar with ductless or filtered hoods and traditional ducted hoods, here is a quick overview. A filtered hood takes ambient air from the lab environment through the cabinet opening at an average velocity of 100fpm (creating negative pressure), air flows into the hood, then through filters at the top, and then recirculates clean air back into the lab. A ducted fume hood takes ambient air from the lab environment in through the cabinet opening at an average velocity of 100fpm (creating negative pressure) and exhausts it through the top of the hood, out through ductwork and outside of the building into the outdoor air.